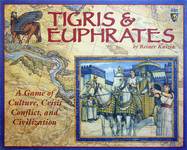 Description: Regarded by many as Reiner Knizia's masterpiece, the game is set in the ancient fertile crescent with players building civilizations through tile placement. Players are given four different leaders: farming, trading, religion, and government. The leaders are used to collect victory points in these same categories. However, your score at the end of the game is the number of points in your weakest category, which encourages players not to get overly specialized. Conflict arises when civilizations connect on the board, i.e., external conflicts, with only one leader of each type surviving such a conflict. Leaders can also be replaced within a civilization through internal conflicts. Part of what is considered Reiner Knizia's tile-laying trilogy.